Zach: Hey Syd, we're excited to see you here in Chicago this weekend! Have you guys been to Chicago before? What's your take on the city and the music scene? Syd: Chicago's doing really well right now, there's a lot of great stuff coming out of Chicago and I think it's dope. Very windy. Zach: You'll be here supporting Ego Death. You guys have said the title of the album refers to how many people rely on Facebook and Twitter and Instagram for self worth But now you are starting to blow up online and have to rely on Facebook and Twitter. So how do you balance those two conflicting feelings? Syd: I mean, we realize the power that it has and the usefulness of it as a marketing tool, so we'd be stupid to ignore that and so we use it when we need to. And aside from that, I dunno, the older I get I've found the less I pay attention to it all, which may be a good thing. I dunno, it can be really frustrating sometimes, when you pay too much attention to it, when you start looking at likes and comments and stuff. So I'm just trying to live in the real world, which is hard when you're on tour because you have a lot of down time--ironically, because you're always moving. During those 8 hour drives, I've been trying to read more. Zach: What's on the reading list? Syd: It's this book by the same writer as Gone Girl...it's called Dark Places, and the girl in the "Girl" video told me to read it. Zach: Speaking of dark things, listening to Ego Death and comparing it to earlier albums that you guys put out, it has that much darker sound that's really taken off in the mainstream. Why do you think that that type of aesthetic has gained such a strong foothold in the past year with R&B/hip hop listeners? Syd: I think drug culture has a lot to do with it. I think it's kind of trendy right now to do drugs for whatever reason, and a lot of the drugs that are popular right now are downers. They can make you feel dark, and the music can also feel a lot better when you're on them. I don't do drugs but I think that has a lot to do with it. Zach: It does have a lot of the Frank Ocean codeine sound. You guy are collective-mates in Odd Future, so that makes sense. How has being part of Odd Future and working with people like Tyler the Creator influenced your music? Syd: Well personally, when I was really making beats or trying to, I was watching Tyler and Left Brain make beats a lot, and I think that informs my production personally, but I didn't produce anything on Ego Death. But I will say that Odd Future has influenced the new members of the band--like [guitarist] Steve Lacey and [keyboardist] Jameel Bruner came into the band during the process of making this album. And they were both Odd Future fans before we met them and stuff like that. Particularly with Steve you can hear the influence, it's very subtle but you can hear it and I think it's pretty natural. Zach: You did a lot of the recording for Ego Death at your house, in your basement. You live there with your parents. I know for a lot of creative people, they need to escape the feeling of home and get out of that comfort zone to find their creative space. How do you manage to stay in a creative mindset when you're living in the comfort of the house you've lived in since you were 2? Syd: My house is really big. And it's always been a safe haven for me and all of my friends, it's always been a safe zone. I like to work where I feel comfortable in a place where I can go into the next room and take a nap if I want to. I've never really been the type of artist that likes to go buy studio time and be under that pressure of having to make something because you're paying for this time. I just kind of like to create when I'm in the mood. So living at home allows me to do that, my parents are super supportive. I have a rehearsal room at home, I have a studio in my bedroom and a studio in my basement so if I get bored of one space I can just go on to another room. Zach: It must require so much self-discipline just to continue to do the work, even when you're waking up in your room with that temptation to just have a relaxing day. Syd: It's definitely interesting having to set your own schedule and tell yourself when to work. But thankfully with the work that I do, there's so much that goes into it, so if I don't feel like making music, I can think of a video concept or I can try to put together a behind-the-scenes video on my computer, or I can practice singing, or learn a new song on the guitar. I don't get bored easily. Zach: You talk about singing, and I know that you didn't really sing until quite recently. How would you say that your voice has evolved over the course of The Internet's career? Syd: I started taking voice lessons maybe two years ago or a year and a half ago. And my voice since then has gotten much fuller. Pretty much all my albums, I've really only been able to sing in my falsetto and in my mixed voice. And so with this album, when we were learning how to perform this album live, I was learning how to use my big voice, my chest voice. And that's been really difficult for me. It's been an interesting challenge and frustrating but I'm getting somewhere and thankfully I'm starting to progress. Zach: You got to collaborate with a lot of cool people--Janelle Monae, Vic [Mensa], Tyler [the Creator]--and Justin Fauntleroy had a cut on the record. What would you say is the most important lesson you guys gleaned from some of these other people you collaborated with in the making of Ego Death? Syd: Personally I learned the most from James Fauntleroy about writing, and about being persistent and about not taking it too seriously. I learned a lot of that just from watching him, watching interviews of his online--he probably doesn't know that--but when we worked together, just watching him write the song [For the World] was interesting because had it been me, I would've given up much sooner. But he really stood in the booth for like an hour, hour and a half, until the song was written, and then he came out like, "There you go." I was like, "DAMN." I wouldn't have been able to stand in the booth that long, 'cause I would've felt like it wasn't working. That just taught me that sometimes it takes a little longer and not to feel bad if you need some more time. Zach: A name like The Internet breathes independence and self-release. So what was it like having Columbia, a big major record label, distribute this record? How did that affect your mentality about your music, if at all? 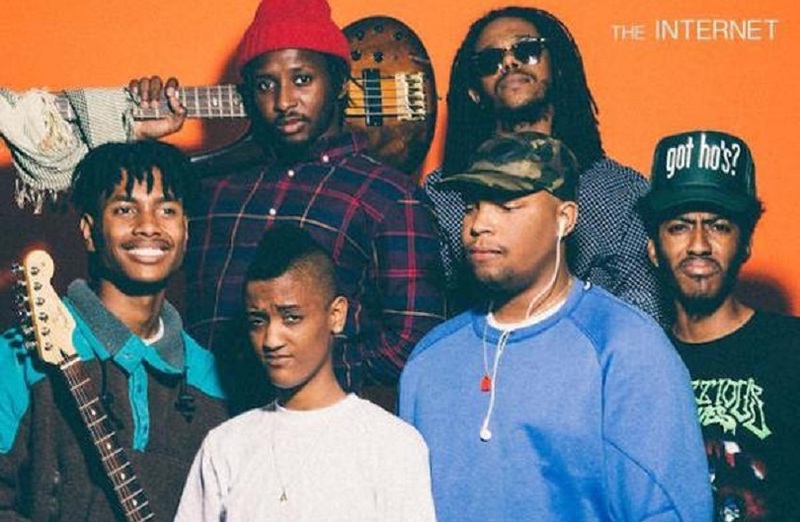 Syd: I don't think it's changed the mentality or anything like that, I think I'm thankful for them because they've done a lot for this album and for the last one and it's been a learning process releasing the album under a major. I think we've grown from it, I think I've gotten smarter and I've learned to separate business from emotion, which I think has been really important. The Internet will be performing at Bottom Lounge on October 4th. Want tickets? You'll have to go to the secondary market--the show is sold out.